I recently saw that there are already UHD 4K Blu-ray drives (with SATA) available, like this one from Pioneer which should (combined with appropriate USB housing) make mounting the disks in macOS possible. So I was wondering if I can get UHD Blu-ray playback on my new iMac 5K 2017 working? Regarding software: As of my understanding AACS 2.0 has not been cracked yet, so ripping is out of question at the moment. But there seems to be software for Windows which supports UHD BD playback, like the newest version of PowerDVD. However, I wasn't able to find an equivalent software for macOS. 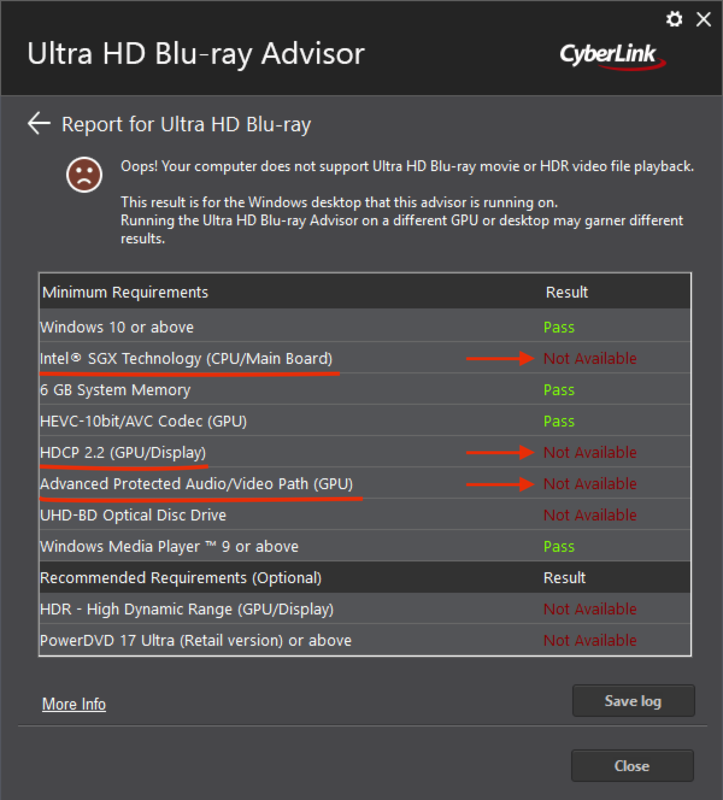 I found serveral "guides" and "how to"s, listing software they claim to support UHD BD playback (and even ripping), but none of the companys official websites advertise such a feature. Has anyone got playback of 4K Blu-Rays on the Mac working, tried it or has any experience on this topic whatsoever? Am I right about my assumptions regarding the hardware support? P.S. : I hope this is the right branch to post this question to. Please redirect if it isn't. I'm not completely sure what to take out of this. Either there really are hardware problems or it is just some compatibility/driver issue with Bootcamp (that maybe doesn't occur in macOS). The Intel i7 7700K does support Intel SGX according to Intel but the feature could be disabled...? It most certainly means that playback with PowerDVD (also from CyberLink) in Bootcamp will not be possible (at this stage). Could it really be that HDCP 2.2 isn't supported due to the iMac's hardware? Does anyone know of a similar diagnostics tool for macOS? Yes, you can get UHD working through that blu-ray drive. Copyright decrypting, hardware acceleration etc are all features implemented in prior chips so they're definitely in Kaby Lake. Display is HDCP 2.2. I think the biggest difficulty here will likely be in finding good software. I would plan on having to buy some, shop around and find the best one for you. I don't have any recommendations for software but I know that it should work & looking around there's at least some software that claims to do this. UPDATE 2018: I got this working a few months ago using MakeMKV (forum) and the "Asus BW-16D1HT" drive to rip the Blu-Rays and IINA for playback. Note: the iMac 5K 2017 doesn't have a HDR screen of course, so the colors have to be mapped. Not the answer you're looking for? Browse other questions tagged macos imac video 4k blu-ray . Which internal Blu-ray drives are compatible with a unibody Macbook Pro? Can I play Blu-ray discs directly on a MacBook using an external drive?